Funko's Mystery Minis are addictive desk toys - they don't do anything, but they're small enough to look cool arranged in a display. That's why we've reviewed dozens of the things! The newest series is based all on retro videogames, and has an easy contender for packaging of the year: while the figures are still blind-boxed, the boxes are designed to look like little arcade cabinets! Brilliant! Each box is specific to its contents - that is to say, the Pac-Man box will only have Pac-Man characters, the Dig-Dug box will only have Dig-Dug characters, etc. 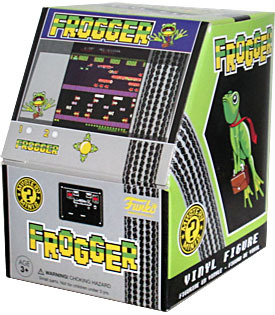 And in the case like this, where there's only one character from the game in the assortment, the Frogger box contains Frogger. In the actual game, Frogger was just a green pile of pixels that hopped orthogonally around the screen when you moved the joystick. 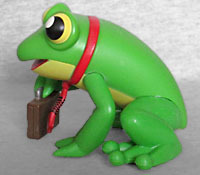 The cabinet art, on the other hand, depicted him as a businessfrog who was apparently on his way home from work, and that's what this toy gives us, too: a little green frog, squatting down, wearing a red necktie and holding a brown briefcase. That is ridiculously cute! The figure is much bigger than expected - he seems sized more to hang out with the "Really Big Mystery Minis" than with the normal ones. But man oh man, he's just! So! Cute! that you won't even care what size he is. 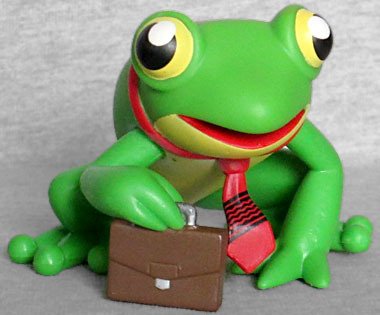 A frog with a necktie and briefcase! And a little smile! That's just the best! And as a reminder, since this is the only Frogger character in Series 1, if you see the green box, you can be 100% certain he's what you're getting.